Reply, for 'Mrs Fraser'. 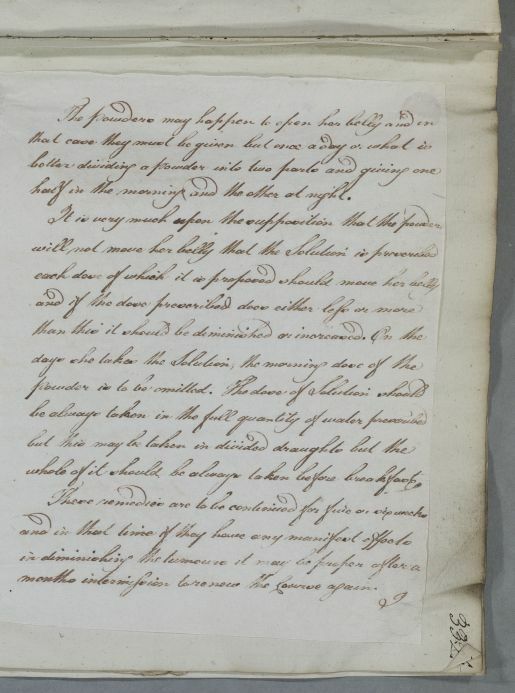 Cullen had formerly postponed prescribing medicines to treat Mrs Fraser's tumour of the neck due to her pregnancy. 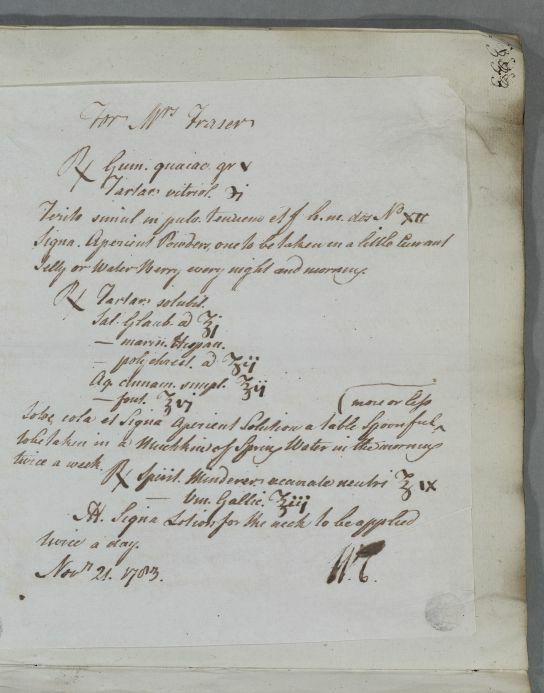 As Mrs Fraser is not nursing and her symptoms have not improved, Cullen prescribes an aperient powder, an aperient solution and a lotion for the neck. Summary Reply, for 'Mrs Fraser'. 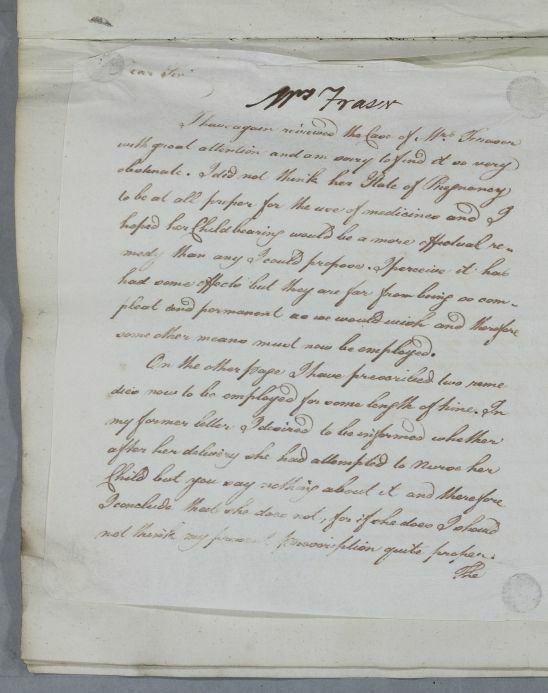 Cullen had formerly postponed prescribing medicines to treat Mrs Fraser's tumour of the neck due to her pregnancy. 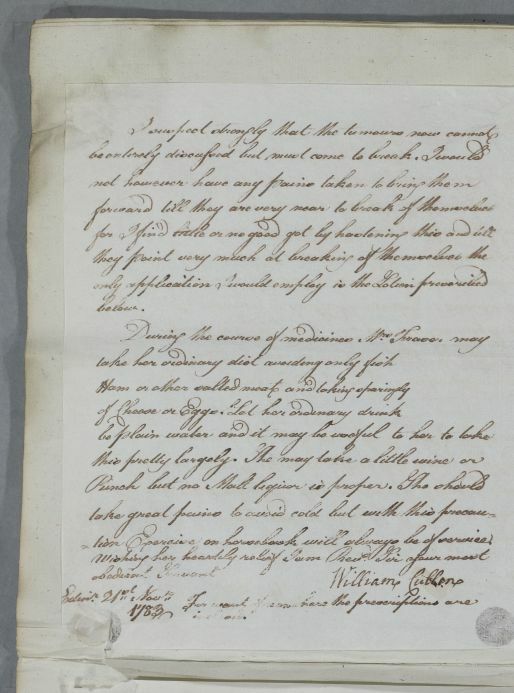 As Mrs Fraser is not nursing and her symptoms have not improved, Cullen prescribes an aperient powder, an aperient solution and a lotion for the neck. some other means must now be employed. not think my present prescription quite proper. half in the morning and the other at night. whole of it should be always taken before breakfast. months intermission to renew the Course again. tion Exercise on horseback will always be of service. Take five grains of Gum guaiacum and one scruple of vitriolated Tartar. Crush the ingredients into a fine powder, and let twelve doses be made. Label: Aperient Powder, one to be taken in a little Currant Jelly or Water Berry every night and morning. Take one ounce each of soluble Tartar and Glauber's Salts, two drachms each of Spanish sea Salts and polychrest Salts, two ounces of simple cinnamon Water and six ounces of spring Water. Dissolve, strain, and Label: Aperient Solution, a tablespoonful ↑more or less↑ to be taken in a Muchkin of Spring Water in the morning twice a week. Take nine ounces of accurate, neutral Spirit Minderer and three ounces of French Brandy. Mix. Label: Lotion for the neck to be applied twice a day. Jelly or Water Berry every night and morning.